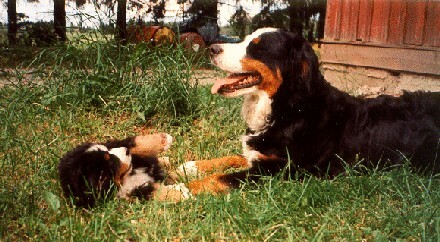 In 1990 we got our first Bernese Mountain Dog from Switzerland, Alfa vom Buchenbühl, “Sandy” (A1 0/0). Sandy will always have a huge space in our hearts and we are very happy that the line from our first Berner is still continuing in our breeding. Maroussia V-litter (2016) is the 8th generation offspring after Sandy and 7th generation Maroussia bernese. From the first Maroussia-litter (born 1993) FI CH Maroussia Alfaberlina “Jetta” (A 0/0) stayed home. We get to keep her 14 years. Jetta was everything a Berner should be; gentle and self-confident, lived a long and healthy life visiting the vet only for her vaccinations and she was beautiful. Jetta gave birth to 4 litters, easily and without caesarian sections and she was full of life until the very end. Jetta was a dream that will stay in our minds forever and she is also a goal for us, just the kind of Berner we want to breed. Breeding Bernese Mountain Dogs is very rewarding, but also very challenging. 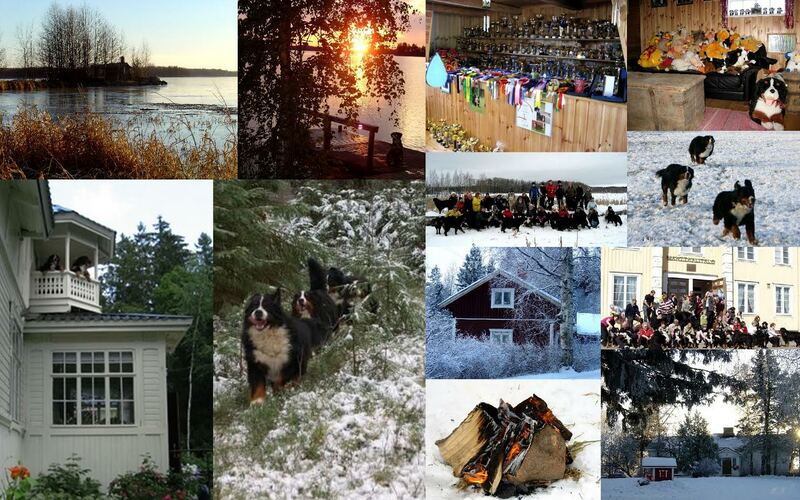 No one can do it just on their own, so co-operation with both Finnish and foreign breeders is very important. We have imported several dogs from abroad and Maroussia-dogs have been exported in many countries. The latest export was “back” to the homeland of the breed, Switzerland. We are very proud that offspring from MULTI CH Maroussia Esprit, MULTI CH Maroussia Halina and Maroussia Zante-Zhivago are living in many countries in the world and some of them are having a great succes. All Maroussia-litters are planned very carefully. Our goal is to breed long-living, healthy, well-moving, good-tempered and beautiful Berners that conform to breed standard. We are trying to find the best possible families for our dogs and we will provide them with specific feeding and caring instructions. We hope that the co-operation with Maroussia-dog owners will last for the dogs whole life and hope to hear from their possible use in breeding and all the significant things in their lives. We think that open sharing of information is extremely important in breeding Bernese Mountain Dogs.